I’ve been keeping a secret from nearly all of you. For months and months. My secret is that Stephanie Sprenger (of Mommy, For Real and my collaborator on The HerStories Project) and I are publishing a book! 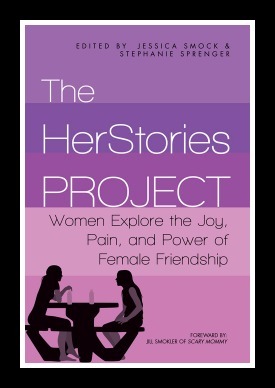 It’s a collection of stories about female friendship from 50 writers. They’re stories of childhood and adolescent friendships, of broken friendships, of life-saving friendships, of friendship during the early years of motherhood, and of online friendships. We also asked two national friendship experts — Shasta Nelson (author of Friendships Don’t Just Happen! : The Guide to Creating a Meaningful Circle of GirlFriends ) and Carlin Flora (author of Friendfluence: The Surprising Ways Friends Make Us Who We Are ) — to share their knowledge about the influence of friendship in our lives. And then there’s Scary Mommy. Yes, Jill Smokler herself is writing the foreword to the book. We are honored and thrilled, as you can imagine. During the last weeks and months, we’ve been collecting these essays and redesigning our HerStories website. Please check it out and let us know what you think! Right now, to celebrate the launch of the new website, we’re also giving away two copies of She Matters: A Life in Friendships , the critically acclaimed memoir by Susanna Sonnenberg that inspired Stephanie and me to begin The HerStories Project. It’s an amazingly well-written and enthralling book that made us think about all the friendships that impacted our lives. Head over to HerStories to enter the giveaway…. On the website, we’ll be writing about publishing journey, about our contributors, about announcements related to the book, and about the complexities of female friendship. And we are so proud of the contributions of each of our writers. It’s been a pleasure to interact with and get to know all of these talented women. We have a snazzy Contributors Page that will tell you a little about each of them. Please check out the new website and tell us what you think! Mazel tov. What an excellent project. Congratulations on your book and new site! What an achievement! Woo hoo! I can’t wait! Samantha Brinn Merel recently posted…An Exciting Announcement. Congratulations, Jessica! So excited for you. That page, and the whole site, and the whole project is so cool. I know it’s been a labor of love for you two and I’m just beyond honored to be involved.